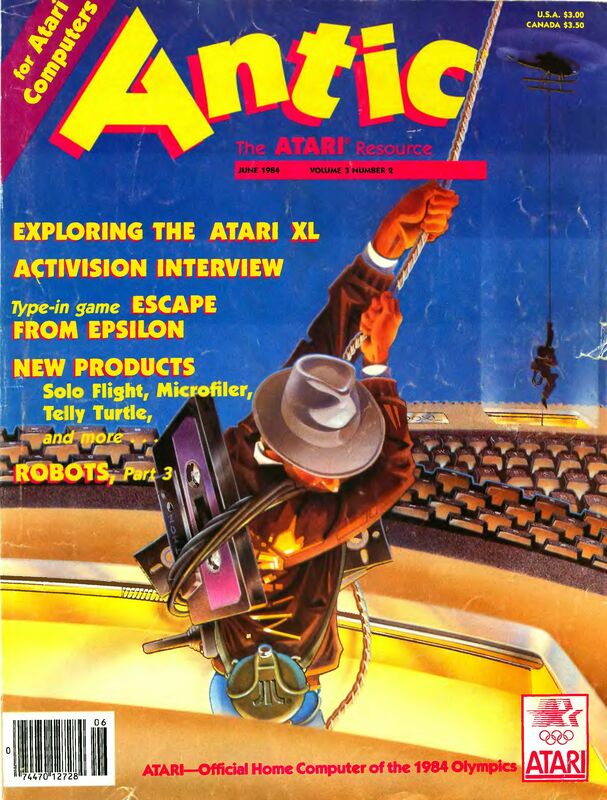 There can be no doubt that the early 1980s were the golden age for games on the Atari 8-bit computers. The Commodore 64 was rapidly surpassing Atari by this point but Atari was still going strong though it wouldn’t be for much longer. 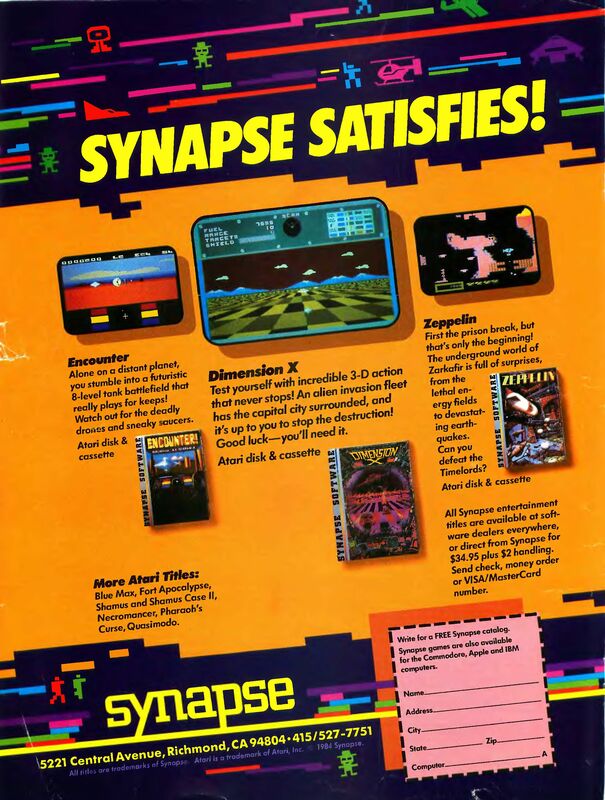 Synapse made a ton of great games for the Atari 8-bit and other 8-bit computers. This ad from the June 1984 issue of Antic highlights several of them. Alone on a distant planet, you stumble into a futuristic 8-level tank battlefield that really plays for keeps! Watch out for the deadly drones and sneaky saucers. This one was sort of a clone of Battlezone, the vector based arcade game. Test yourself with incredible 3-D action that never stops! An alien invasion fleet has the capital city surrounded, and it’s up to you to stop the destruction! Good luck – you’ll need it. This one tries to be a slightly more advanced version of something like Battlezone or Encounter but at the end of the day, the game play wasn’t as good with this game. First the prison break, but that’s only the beginning! The underground world of Zarkafir is full of surprises, from the lethal energy fields to devastating earthquakes. Can you defeat the Timelords? This was a side-scrolling shooter of sorts that takes place in underground caverns. A funny place for a zeppelin perhaps but this was a really good game and large for its time with 250 rooms to blast your way through. Uniquely, up to four players could play with the extra players controlling various guns on the zeppelin that player 1 was flying. Other titles listed include Blue Max, Fort Apocalypse, Shamus and Shamus Case II, Necromancer, Pharoah’s Curse, and Quasimodo. I played most of these and they were all excellent games though I played them on the Commodore 64 and not the Atari 8-bit. While Synapse had the occasional mediocre game, the average quality was quite high. It’s a shame they went out of business so early (later in 1984) in part because they were ripped off by Jack Tramiel who refused to pay them for software they shipped for Atari. To make matters worse they made a decision to start emphasizing text adventures which started fading in popularity around the same time. Krazy Mazes – An exciting two-player game of mazes and chases written entirely in machine langauge. Univert – How many decimeters are ther in a cubit? How many leagues in a light year? With Univert you can easily convert from any unit of measurement to another. Pixel Averaging on the Atari – This graphics technique will allow you to hide those jagged edges in your computer art masterpieces. 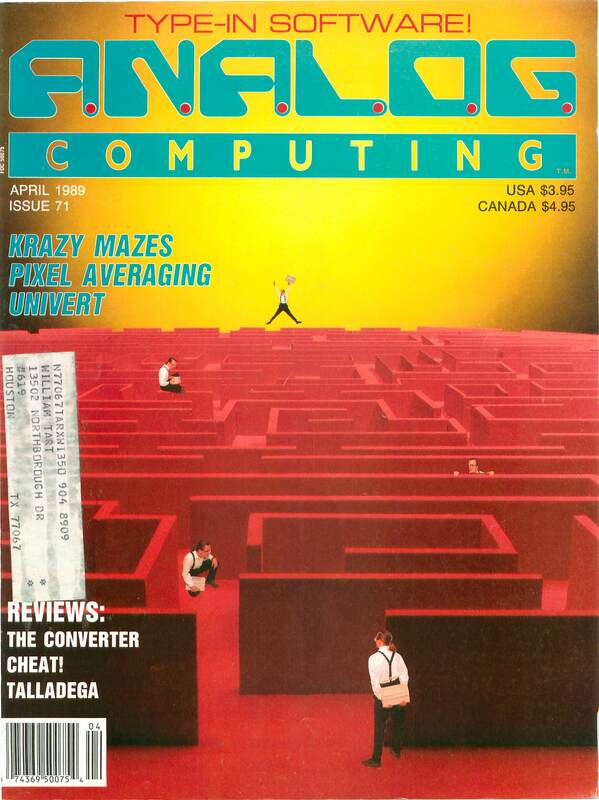 Panak Strikes – This month Steve looks at Gauntlet (Atari) and Richard Petty’s Talladega (Cosmi).